It is the Year of our Lord 1519. The Renaissance slowly gives way to an Age of Reason. A greater power eclipses the Italian city-states: Spain. Like the all of the countries of Europe, Spain is a nation in name only. Until recently a collection of feuding provinces speaking dialects of the same language, Spain is quickly uniting. The Spaniards have fought together against the Moorish occupation…La Reconquista. Final victory was secured 27 years ago in the recapture of Grenada. After menacing Europe for the last 800 years, Islam is on the run. The Spaniards, ever restless and aggressive, found a new outlet for their expansion. In 1492, a Genoese explorer in the pay of the Spanish Crown -- known as Cristobal Colon -- discovered lands across the Atlantic Ocean. They are thought to be the easternmost extents of Asia, sparsely settled only by savages. Since discovery, colonists have slowly populated the islands: Perhaps 30 or 40 thousand souls. But the mainland farther west is unexplored. …and Rumors of Gold. The metal touched by God... Ever bright, ever shining... Leave a gold coin in the ocean for a thousand years, and it will come out looking the same as its first day. Gold is the coveted property of Kings... However, if you gathered all the gold in Europe together (assuming you survived the attempt), it would scarcely fill a large chest. Yet the savages inhabiting the lands to the west reported gold beyond imagining amongst the Empire of the Mexica, also known as the Aztecs. Gold that belongs by right to the Spanish Crown, and to any brave Spaniard that can grasp it. Governor Velazquez has authorized a third expedition to investigate these rumors. The rules I used in "La Conquista" are the GDW House Rules found in Twilight: 2000, version 2.2. and Traveller: The New Era There's much raw material in the Zip file, enough for a campaign seed. 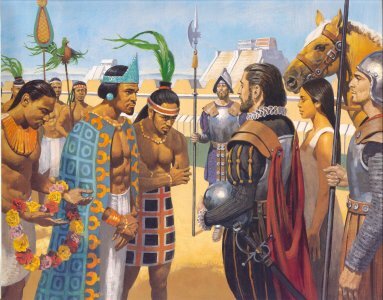 GURPS Aztecs "The empire of the Aztecs stretched from ocean to ocean. They worshipped hundreds of gods, kept elaborate calendars and built gigantic stone pyramids that still stand as testament to their might. Their relentless armies seemed unstoppable. To the Spanish, the Aztecs were monstrous savages . . . pagans who tore the living hearts from thousands of innocent victims to feed a bloody idol. They never understood the culture they were destroying . . . or the philosophy behind the cruelty. The Aztec society was totally alien, stranger than any fantasy land. Now you can visit the world of the Aztecs from the inside." Conquest, by Hugh Thomas. A great read, full of all the details you need. Aztecs: The fall of the Aztec capital, by DK books. A children's book, but full of realistic renderings of the Conquest, and Aztec life. The Lost Temple of the Aztecs, by Shelley Tanaka & Greg Ruhl. Another children's book, more art for your campaign. The source of the art above. Conquistadores, by Terrence Wise & Angus McBride. One of the fine Men-At-Arms series, by Osprey publications. Aztec, Mixtec and Zapotec Armies, by John M D Pohl & Angus McBride. Another Osprey publication. Aztec Warrior: AD 1325-1521, by John M D Pohl & Adam Hook. Another Osprey publication. Below is the link to download my "Conquista" campaign notes. With a little effort you could be on your way to the New World!